New Mexico’s Chris Francis and Cade Passig bested 108 of the top teams in the world to win the 41st Bob Feist Invitational. Chris Francis, 40, and Cade Passig, 24, of Las Vegas, New Mexico, roped six steers in 43.34 seconds for first place, padding their pockets with $122,000 cash, tens of thousands of dollars in prizes and bragging rights for winning the oldest, richest and most prestigious invitational team roping in the sport. Known for its 18-foot head start for extra-strong steers, the BFI is a challenge even for the professionals. Cade’s dad, Shotgun Passig, had been a former partner of Francis’ and when Cade was a toddler, Francis moved in and lived with the family. Today, both men work for Mathews Land and Cattle Company, which sponsored their entry in the world’s richest pro roping event. To win, the pair withstood pressure from the likes of world rodeo standings leaders Clay Smith and Paul Eaves, who finished third, and world champion Junior Nogueira and Kaleb Driggers, who fell to fourth. 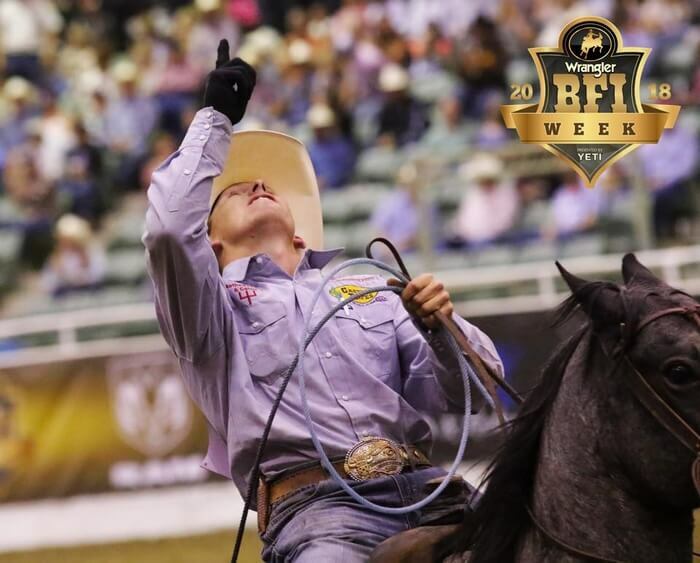 Wrangler BFI Week continues in Reno through Thursday with more events for amateur ropers and payoffs exceeding $1 million. Visit www.bfiweek.com for more. Fourth Round: 1. Max Kuttler and Brandon Bates, 4.27 seconds, $8,000; 2/3 (tie). Cody Snow and Wesley Thorp/Dustin Bird and Paden Bray, 4.93 seconds each, $5,000 each; 4. Rhen Richard and Quinn Kesler, 5.17, $2,000. Aggregate: 1. Chris Francis and Cade Passig, 43.34 seconds on six, $122,000; 2. Bubba Buckaloo and Tyler Worley, 43.79, $89,000; 3. Clay Smith and Paul Eaves, 44.98, $51,500; 4. Kaleb Driggers and Junior Nogueira, 45.56, $33,500; 5. Coleman Proctor and Billie Jack Saebens, 45.66, $21,500; 6. Andrew Ward and Regan Ward, 46.06, $16,500; 7. Garrett Tonozzi and Joe Mattern, 46.58, $14,500; 8. JD Yates and Kyle Lockett, 46.96, $12,500; 9. Billy Bob Brown and Hunter Koch, 46.98, $9,500; 10. Cody Mora and Cord Forzano, 47.77, $8,500; 11. Kade Smith and Casey Chamberlain, 49.34, $7,500; 12. BJ Campbell and Joel Bach, 49.89, $7,500; 13. Randon Adams and Jory Levy, 51.72, $6,500; 14. Rhett Anderson and Coleby Payne, 53.56, $6,500; 15. Tyler Wade and Tyler McKnight, 40.83 on five, $6,500. About the BFI: The Bob Feist Invitational was founded by Bob Feist in 1977 to showcase and reward the world’s best professional team ropers, and is owned today by Ullman-Peterson Events. 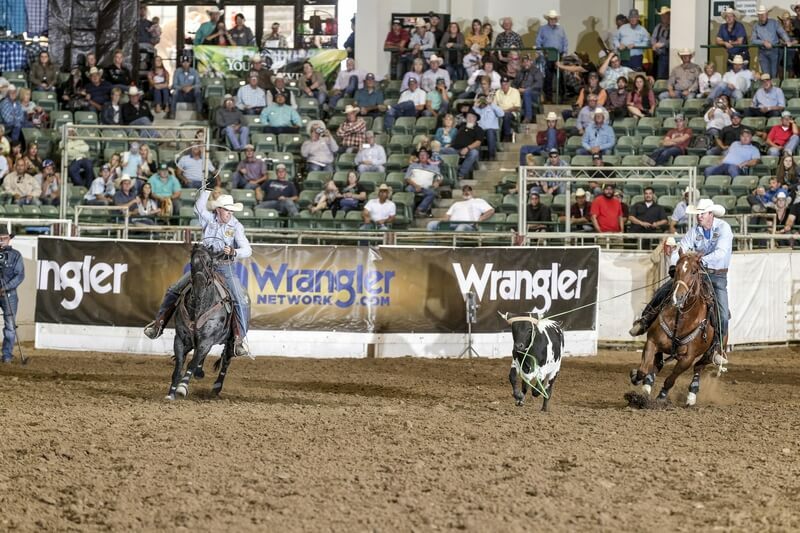 Annually the top 100 teams in the sport are invited to the Reno-Sparks Livestock Events Center in Nevada, where they compete over six rounds for a cash-and-awards package worth more than $700,000.